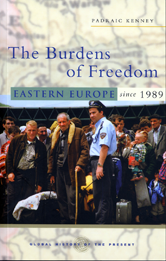 From Estonia to Macedonia, this book is a history of 15 countries as they negotiate their transition from communism. For some, the story ends happily, with triumphant entry into the European Union in 2004. Others are caught in limbo, destroyed by nationalist politics, war and genocide, or crippled by corrupt political practices. The Burdens of History considers the effects of revolutionary change, the resurgence of nationalism and the painful examination of the past. It looks at the process of building stable democratic states, and their integration with international structures. Most of the countries have been active participants in the occupation of Iraq. Domestically, each has seen a divide emerge between winners and losers. All are moving forward simultaneously to democracy, unity and prosperity, and national division, corruption, and economic disparity.